YSP presents the first solo exhibition in the UK by Sophie Ernst. HOME is a major ongoing project confronting political turmoil and displacement with individual memories of home and ideal places. Ernst interviews people forced to leave their homes due to political upheaval, such as during the Partition of South Asia in 1947, and builds an architectural model of the houses they describe. 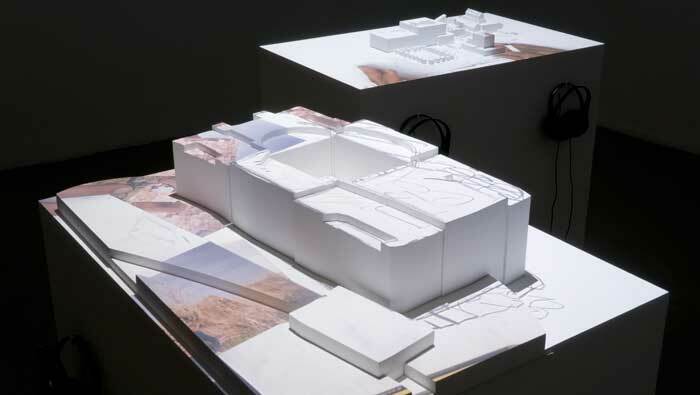 She then projects onto this sculpture video footage of the person's hands as they describe their memory of that building, transforming the inanimate object into a virtually inhabited space, and ascribing a profound intimacy. Born in 1972, Ernst first trained as a industrial mechanic with BMW before graduating from the Rijksakademie voor Beeldende Kunst in Amsterdam in 2000. She won the Golden Cube award at the 26th Kassel Dokfest awarded for best installation. Ernst works between Asia and Europe and was Assistant Professor at the Beaconhouse National University, Lahore (2003-2007).